My quote board on Pinterest is probably one of my favorite places to visit when I’m in need of some motivation. I scroll through it and every time I always come to the conclusion that I need to find a way to make a 3d version and have all the quotes printed out so I can read them every day. I was scrolling through it one day last week looking for a specific quote I pinned a while ago and I stumbled upon another one that I pinned a little while back. I read it and it really stuck a chord and knew I needed to share it. Most days I don’t feel 20. I don’t exactly look 20 either. I often get mistaken for way younger than I really am (I’ve gotten 12 before, no joke). Being 5’1 I’m sure doesn’t help either. Despite the height or how old I feel at heart, I am 20 years old and I need to take advantage of it! I feel like I entered into a whole new phase of life. I am currently 20 years old, living in France by myself for the summer and have never felt more independent (even though I call my parents on the reg). I am living by myself, grocery shopping by myself, going to fashion shows where I know no one, and working at a dream company. I may have turned 20 back in April, but I’m not sure it really hit me until I was here in Paris. I love love love my work and I feel like a real grown up! Every day I feel more inspired to chase after all the wild, crazy, insane, unrealistic dreams I have. 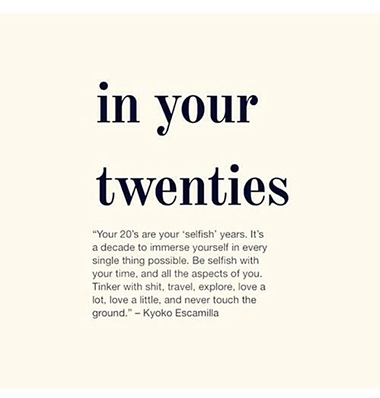 There’s no better time than in your 20s! While most people are terrified at the thought of leaving the safety net of college, I’m anxious to get out into the real world and experience it! Who says college has to be the best 4 years of your life? There’s so much to look forward to in your 20s and instead of dreading having to walk across that stage in 2 years, working at a job I love has made me realize how exciting it can be! So many dreams can become a reality in your 20s if you set your mind to it and allow nothing to get in your way. Although I don’t feel old enough to be 20, I’m ready to embrace a new stage of life! Ready to work harder than I ever have, ready to mess up…over and over and over again, ready to put my dreams first, and ready to live a life I only imagined. So I’m here to say that as sad as I was to leave my teenage years behind me, I’m ecstatic to see what’s in store for my 20s. P.S. Thankful for friends who started off my 20s by surprising me, waking me up to watch the sun rise, and then making this video! Love this! Life can easily look so intimidating when you're twenty, especially because I have no idea where I'll be at this time next year! But I feel like a lot of people forget that right now everything in life is so flexible, that you can really do just about anything! Thanks for this!